Are you stuck for ideas for healthy lunch box recipes or wondering what to pack for lunch every day? Well, I have given few delicious and practical lunch box ideas for work (office), school that are nutritious, healthy and also easy to prepare. Today we will see how to make chapati rolls with a delicious semi dry paneer sabji and also a few lunch box ideas (Indian) for adults and kids. Prepare chapati and keep it ready. Chop all the vegetables and cut the paneer into cubes. Heat oil, add cumin seeds, when it splutters, add finely chopped onions and green chillies. Saute until onions turn transparent. Add tomatoes, all the spice powder and salt needed. Cook until tomatoes become mushy. Add chopped capsicum and cook for a few more minutes. Once the capsicum gets cooked a little, add the cubed paneer pieces. Mix well and cook for 2-3 minutes until the masala gets coated with the paneer pieces well. Add finely chopped coriander leaves. Switch off the flame. Let it cool a little. Take a chapati, keep 2 tbsp of stuffing vertically, fold a little at the bottom as shown below and roll it from the side tightly. Pack it for lunch. The roti will not get soggy as it is a dry sabji. You can prepare the same recipe with other dry sabjis. Lunch should be healthy and nutritious, so avoid packing unhealthy food or junk food or food prepared with maida (all purpose flour) or processed food. Sandwiches prepared with brown bread with a healthy filling is great for lunch. Try protein packed kidney bean sandwich which is good for both kids and adults or spinach potato sandwich or just potato sandwich. You can use leftover sabji like potato curry or carrot beans curry as a filling for sandwich. When packing dosas, make thick and spongy dosas as thin dosas will be become hard and unpalatable when eaten later. You can make uthappam with carrots or mixed vegetable uttappam to make it more healthy.Sponge dosa is also great for lunch as it will remain very soft until lunch time. One pot meals are great for lunch like tomato rice, lemon rice, cauliflower rice,vegetable rice or potato rice etc. Avoid packing khichdi for lunch as it tastes great only when eaten hot. Rajma Chawal (kidney beans rice) sweet corn rice, channa pulao, red beans rice, peas pulao are all healthy, nutritious and high in protein which is required for growing kids. Check out more recipes in my one pot meals section. 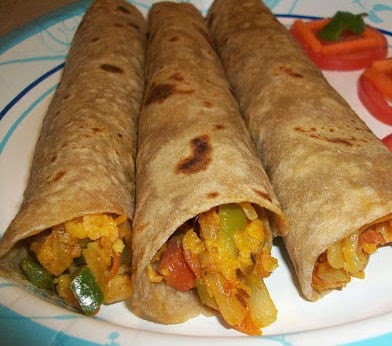 Chapati rolls or phulka with dry sabji works great for lunch. You can wrap it in aluminum foil to keep the rotis soft until lunch time. Curd rice with vegetables or curd rice with fruits is also a great option for lunch. To prevent curd rice from getting sour, add more of milk and less curd. It will set by lunch time. Idli is another great options for lunch. You can make vegetable idli or idly upma. When packing idli with idli milagi podi, mix idli podi, oil and a tsp of water and then apply it on idlys, it will keep the idlis soft until lunch time.